Significant investment is being made into the newly qualified nurse pipeline, but how will the money be spent? I welcome health secretary Jeremy Hunt’s announcement that an additional 5,000 places on undergraduate nursing programmes will be created this year, alongside a trebling of the number of nursing associate training places. 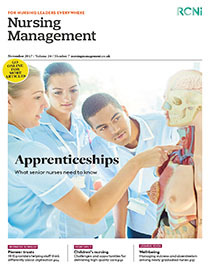 The nursing associate places link to an apprenticeship pathway to registered nurse status, which, according to Mr Hunt, ensures there is a route ‘for healthcare assistants and groups such as porters into nursing’.